QKZ DM9 wired earphones is suitable for almost all audio devices with 3.5mm port. In-ear design with soft earcaps, comfortable to wear and not easy to fall. Also, in-line microphone and control button provide easy operation. 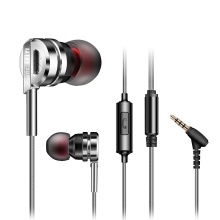 In-ear headphone with 9.2mm driver unit provides natural clear sound and super enhanced bass. 3.5mm headphone is suitable for smart phone, Tablet PC, Laptop, MP3 and other 3.5mm audio devices. 3 sizes of soft silicone earcaps, comfortable to wear, suitable for sports and daily use. Note: Due to the different screen resolution, the color of the product is slightly different. Please refer to the real product.